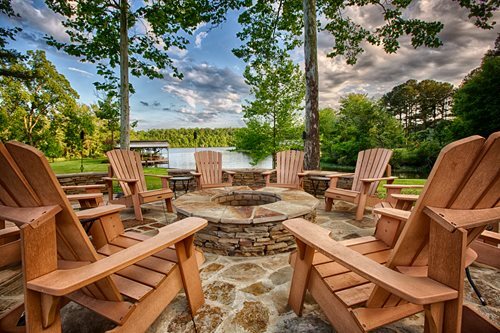 According to Austin Marcum of PROSCAPE, the owners of this property requested a place for entertaining where they could host relaxing gatherings with friends and family. 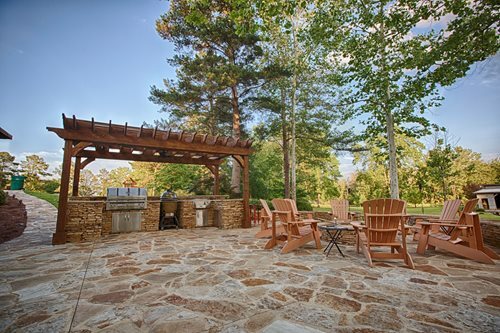 Mahogany flagstone was used for the patio, kitchen and fire pit. Stone was an important factor in establishing the style of the project, which was strongly influenced by the natural surroundings. The grill, sink, and stainless steel cabinetry were made by Alfresco. The smoker is a Cypress Grill from Barbour International. 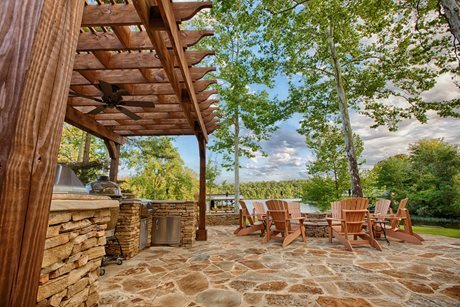 The pergola was built using pressure treated pine to match an existing wooden deck on the property. An oil-penetrating stain was applied to add protection and color richness. 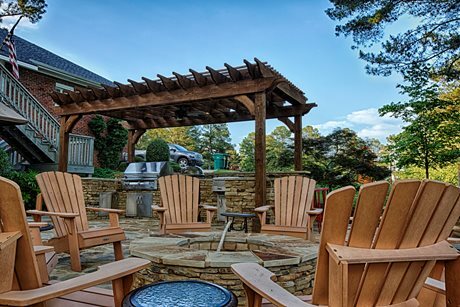 The PROSCAPE team decided to go with a pergola with an open-air structure, rather than a solid roof, to maximize the feel of the outdoor area. Marcum says the biggest challenges on this project were the short time frame and keeping the surrounding landscape largely undisturbed during construction. 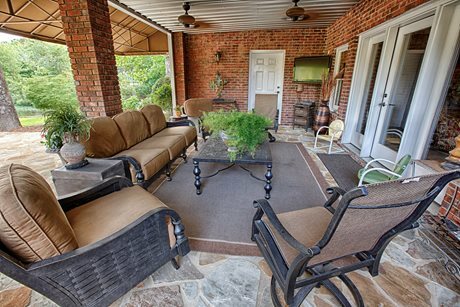 The home also has a covered patio on the same level as the kitchen and fire pit. Deep seating furniture, an outdoor area rug, multiple ceiling fans and a flat screen television, make this space every bit as comfortable as the indoors.